Here are some wonderful historical detective TV shows based on novels. 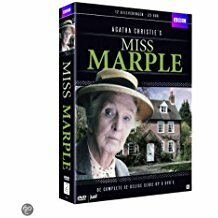 “Miss Marple” – The British 1980s series starred Joan Hickson in the title role and effectively mixed the elements of murder and cozy village life. 12 episodes were made over a course of 3 seasons. The programme also featured such well-known British actors as Peter Davison, Jean Simmons, Paul Eddington and Claire Bloom. 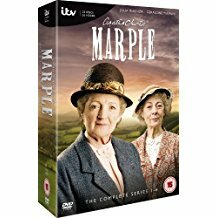 “Marple” (2004-2009) – The newer series starred Geraldine McEwan and later Julia McKenzie in the title role and had a darker, sexier tone than its predecessor, as well as sometimes changing elements of the original novels/stories. 23 episodes were made over 6 seasons with Geraldine McEwan in the first 3 seasons and Geraldine McEwan in the last 3. Other actors who appeared included Joanna Lumley, Ian Richardson, Timothy Dalton and Juliet Stevenson. 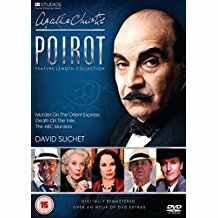 “Agatha Christie’s Poirot” (1989-2013) starred David Suchet as detective Hercule Poirot, with 70 episodes filmed over 12 seasons. Hugh Fraser starred as Captain Arthur Hastings and Philip Jackson was Inspector Japp. Other actors who appeared in the show included Samantha Bond, Christopher Eccleston, Emily Blunt, Jamie Bamber and Michael Fassbender. “Agatha Christie’s Tommy and Tuppence – Partners in Crime” (1983-84) starred James Warwick and Francesca Annis. It effectively recreated the 1920’s light-hearted atmosphere of the books and also starred Reece Dinsdale as Albert and Arthur Cox as Inspector Marriott. 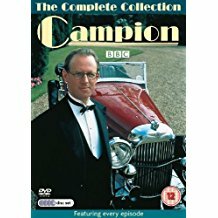 “Campion” (1989-1990) starred Peter Davison as the wealthy 1930’s detective, Albert Campion while Brian Glover was his manservant, Lugg. “Lord Peter Wimsey” (1972-1975) starred Ian Carmichael in the main role along with Glyn Houston as Bunter and Mark Eden as Inspector Charles Parker. 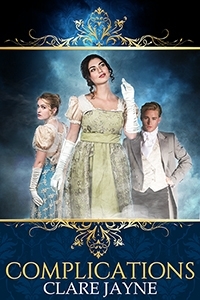 22 episodes were made of this BBC series. 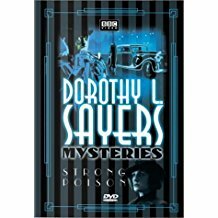 “A Dorothy L. Sayers Mystery” (aka “Dorothy L. Sayers Mysteries”) (1987) starred Edward Petherbridge as Lord Peter Wimsey and Harriet Walter as his detective/romantic partner, Harriet Vane. 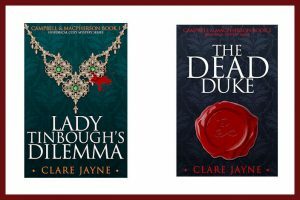 3 novels – “Strong Poison”, “Have His Carcase” and “Gaudy Night” – were adapted over 10 episodes. “The Inspector Alleyn Mysteries” starred Patrick Malahide in the main role which is set in the 1930s and 40s. Simon Williams appeared in the Pilot episode as Alleyn. Love your blog. Joan Hickson WAS Miss Marple. Every nuance of her acting the part was pitch-perfect. And the other parts, down to Colonel Bantry with his pigs, were always beautifully done. Same for Suchet, I think. He inhabited the Poirot role. Hugh Fraser was also a brilliant Hastings, and Pauline Moran was superb as Miss Lemon. Worth a mention in your blog: Kenneth More’s Father Brown (the new Mrk Williams Father Brown is more of a pastiche tribute than a genuine retelling of Chesterton). Thanks very much for your comments, Evelyn, and I agree completely about the wonderful actors in “Miss Marple” and “Poirot”. I somehow missed Kenneth More’s version of “Father Brown” so I’ll look out for that. Thanks Clare! I forgot to say about the Inspector Alleyn Mysteries which are true in spirit, I think, to the more theatrical (contrived?) nature of Ngaio Marsh’s books. They are very entertaining but sometime verge onto Midsomer Murders territory (not always a bad thing! – can be great fun). E.g. as I’m sure you know, “Scales of Justice” turns on whether an angler has caught one particular trout in a stream!